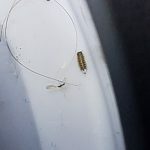 When we first read our reader’s message, we thought we would probably be looking at a photograph of carpet beetle larvae, but this is not the case. 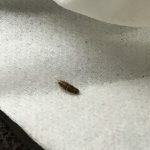 Carpet beetle larvae are extremley common household pests, and since they feed on several materials found in or on a bed, they are the most common type of organism to be found on, or under, a bed. However, carpet beetle larvae don’t look much like the specimens in the photo. Some species do have similar pill-shaped bodies, but they are rusty orange colored and covered in tiny bristle-like hairs. 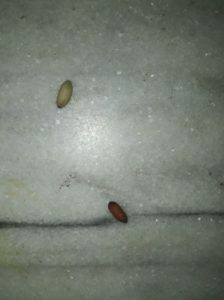 So, if these aren’t carpet beetle larvae, what are they? Well, we do think they are some type of larvae, just not carpet beetle larvae. 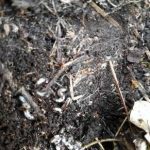 We think they are most likely some species of fly or moth larvae, but we can’t determine this based solely on the photograph. Many species of fly and moth larvae look nearly identical, especially those that don’t have many (if any) distinctive markings of features. 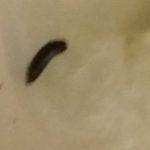 We will say that based on the extreme roundness of these larvae we think they have been eating nonstop for several days and are probably about to pupate and mature into adults. 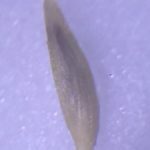 Although we can’t offer a specific identification for these larvae, we still think we can help our reader get rid of them. This is because getting rid of most household pests simply requires cleaning! We encourage our reader to sweep out under his bed, wash all of his bedding, and clean his entire room. Eliminating as many tiny particles as possible (a.k.a. 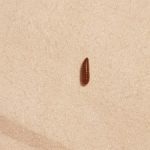 potential food sources) is the best way to get rid of these larvae and to prevent them from coming back! To wrap up, a reader asked us about some worm-like organisms he found under his bed. We aren’t sure about the identity of these specimens, but we think doing a thorough cleaning of his room will be the best way to get rid of them. What Are "Pests" Found Under Bed? 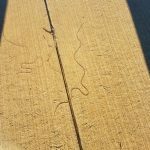 A reader asked us about some worm-like organisms he found under his bed. We aren't sure about the identity of these specimens, but we think doing a thorough cleaning of his room will be the best way to get rid of them. 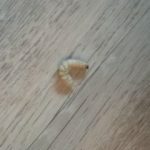 Could Worm in Bed Be Carpet Beetle Larvae?